Any guesses as to who these well-dressed gals might be? I'm pretty sure only my sister will have the correct answer, as that's her on the left and me on the right, when we were about 12 and 9. I've always admired Laurie's artistic talent and saving the paper dolls and clothes she made for us to play with ages ago must be a symbol of my appreciation. ...Not to mention they bring back memories of summer days spent playing on the shady porch of the house where we grew up. A while ago I mentioned to her that I still have the dolls, so thought I'd surprise her by posting pictures here for her (and the world!) to see. 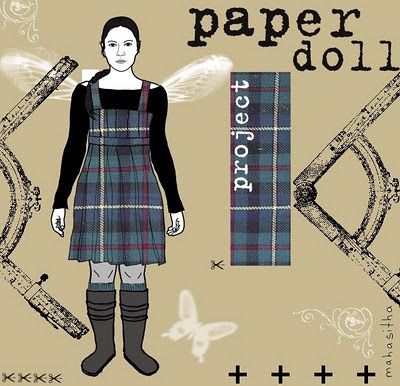 Something else that prompted this post was a clever blog I came across called The Paper Doll Project. Launched a few months ago by Anastasia Shookaty in Ukraine, she asks that anyone who is interested to download a printable picture of a paper doll she created of herself, design a dress, email a picture of the doll wearing it to asia.shookaty at gmail dot com (replacing "at" and "dot" with the proper symbols), and she will post it. Anastasia has received several creations so far, such as a beaded dress, one made of wallpaper, and another that's patterned after a glass painting. 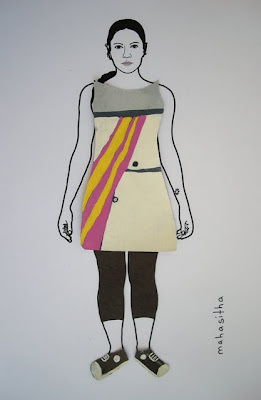 Here's a sample outfit by Alex Kokkota who painted on newsprint. Anastasia would love more participation, so become a kid again and let your imagination run wild. Use the medium of your choice to decorate a dress, and maybe get your daughters or granddaughters to join in too... the more the merrier! And just to prove I didn't let my sister have all the fun, here are two questionably stylish outfits I made back in the day. Notice how form-fitting they are - apparently I took tracing very literally! I'm not sure why my left hand is held out flat... perhaps to catch myself when I fall over? I do know that I'm wearing pajamas and holding a flashlight (well almost, with my Bart Simpson fingers - ha) because I would read under the covers after lights out, you know. How times have changed - now we love it when kids read a lot, as opposed to any number of other vices! By the way, the big E stands for Euclid, the mathematician, and the name of our elementary school. That sounds like a really cool site. I love your paper dolls how cute. I used to love to play with paper dolls. I think your paper dolls are adorable and so nice that you have saved them. Its so wonderful that you have treasured those dolls...childhood memories are always so special ! How wonderful to still have those and to design your own at such a young age is remarkable. It takes me back to the early 50's when we lived on the east coast and my friend and I would visit the local penny candy stores, looking for the newest Hollywood paper doll cutout book. Think the books cost about 35-45 cents in those days. Hi Ann, What fun we had in long summer hours on the porch! I recognized us immediately upon opening your blog when our little heads popped up on my screen. Remember Betsy McCall? These early crafts were certainly a good foundation for a lifelong pleasure of the arts, weren't they? Ha! Those are adorable, and I can't believe you still have them!